Elkhart County, Indiana, is the RV Capital of the World. 80% of this country’s recreational vehicles (RVs) are manufactured here. There are about 16 different factory tours in the area, enough to make your head spin. We did not take any of the tours, we just ran out of time. But we’ll be by here again. We were at the RV/MH Museum and Hall of Fame here a few years back and enjoyed it so much we stopped in again today. There is a lot of history here, from the first RV from 1913 to brand new ones of today. Many of them were open for us to enter and see inside, some were roped off. It was a journey through time. After the museum visit we sat in the parking lot and waited out a passing rain storm. Once that was over we moved east, crossing into Ohio. 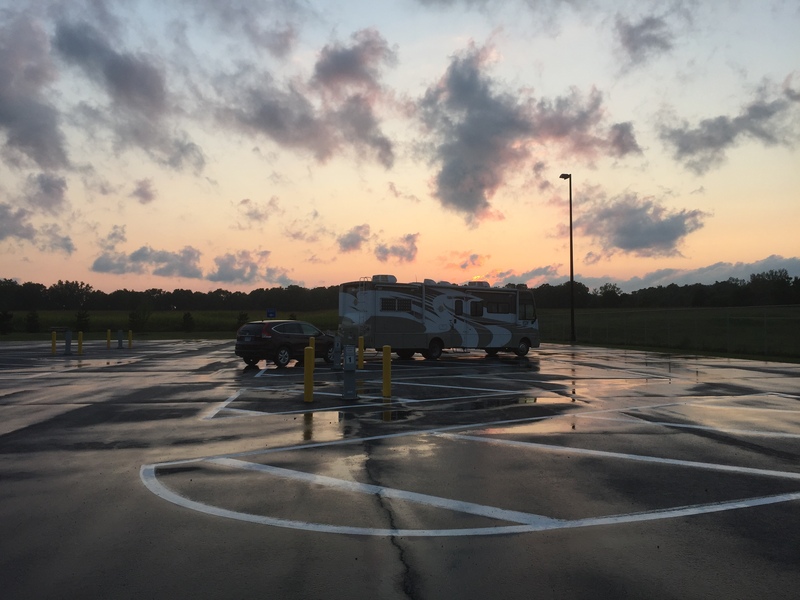 Tonight we are staying in a special RV only lot at a Service Plaza on the Ohio Turnpike. For $20 we have electricity and access to a dump station and fresh water. I’m needing the air conditioning, it’s been warm and very humid. And, now we are in the Eastern Time Zone. This entry was posted in August, Daily Post, Ohio and tagged Elkhart, Factory Tours, Museums, Ohio Turnpike, RV Capital of the World, RV/MH Museum. Bookmark the permalink. Changing time zones is always fun! We stayed in Elkhart for one night many years ago and there was a terrible thunderstorm while we were there. Unfortunately we couldn’t explore because of the storm.